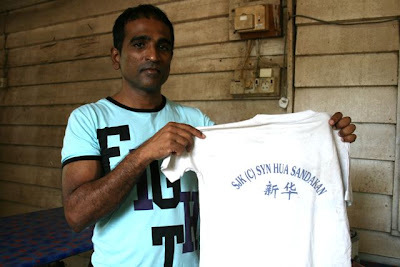 We visit on our third day in Sandakan. She looks surprised to see so many of us. But we’re even more taken aback by the state of her little two-bedroom flat. Vui Fung had told us earlier that she lives alone. We’d half-expected her home to be gloomy and untidy. But the place is immaculately kept. Clean, and bright and airy. There are photos of her children and grandchildren everywhere. A large, framed family portrait takes pride of place in the living room. We’re all nervous about meeting her. 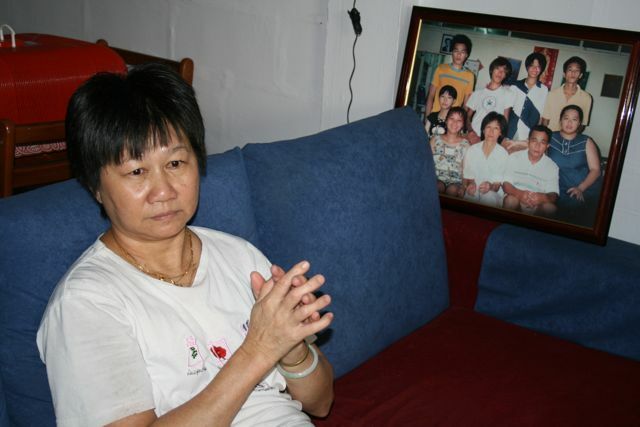 Terrified we’d somehow let slip what she must not be told – that Vui Kong, her youngest son, sits on death row. We’d all heard her heartbreaking story. 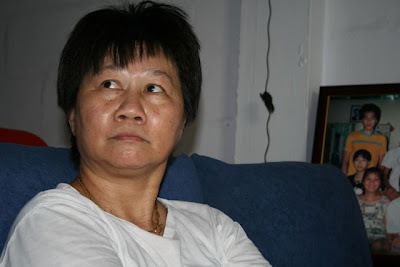 We know of her mental illness, her struggles as an impoverished single mother, her visit last year to Changi Prison, to see Vui Kong just two days before he was originally scheduled to hang. He had told her he was going away to seek penance for his sins and that he would never ever return. That narrative had confused me back then. Did she really buy the story? Surely, a mother must know? Meeting her now, I finally understand why Vui Kong felt he had to protect his mother from the truth. It is impossible to have a conversation with her. She hardly says a word. Doesn’t acknowledge anyone’s questions. It is as if she’s living in her own little bubble, a bubble you dare not burst. Vui Fung blames it on anti-depressants. But her older kids don’t want to wean her off the pills – they’re afraid she might sink back into depression and try to kill herself again. The previous day, we’d visited their old house, a two-storey building in the middle of an oil palm plantation. No one lives there now. It’s where the family keeps their unwanted junk. Inside a room full of odds and ends, Ravi (Vui Kong’s lawyer) found an old cupboard full of children’s things. Her children’s things. 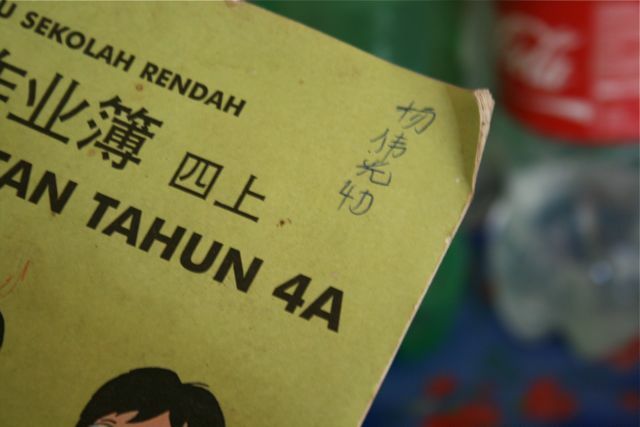 Vui Kong’s mother had carefully preserved his old textbooks. Primary 1 to Primary 4. He’d dropped out of school after that, to find work in the city. We found Yun Leong‘s report card. He was an excellent student. If only he had kept on studying. We found an old school t-shirt and tiny shorts. All meticulously packed away. The flat is overflowing. Full of relatives and community leaders and other well-wishers. Sabah MP Chua Soon Bui drops by for a visit. She is a warm woman, dynamic and committed and full of ideas. We are all sceptical at first. What good would it do her to go see a bunch of monkeys? But it turns out to be an excellent suggestion. She is carefully dressed for the excursion. A pretty top. Silver sandals. Ravi remarks that it’s clear there’s a part of her that wants to live and live well. She bothers. She’s not given up on herself. It’s a lovely day for a walk. But we’re afraid she might be bored. It’s hard to tell. She doesn’t say anything. Doesn’t tell anyone how she feels. We wonder if she’d rather be at home. But then, after the walk, we go to a coffee shop for kopi and cakes and a relative remarks that in her youth, Vui Kong’s mum loved karaoke. The revelation sets Ravi off. He starts singing a Chinese ditty – something he learnt in the army. None of us know the song. But there is a flicker of recognition in her eyes. She smiles, and then breaks out in laughter. Laughter. It is infectious. We join in, amazed. There’s a suggestion to go eat durians. Sabah’s best. We look at Vui Kong’s mum. “Durian?” Vui Fung asks her tentatively. “I want to eat durian,” she says in Hakka. A complete sentence. All of us who were there that day still talk about that outing. Her laughter. The way she attacked those durians. We talk about how she makes you instinctively want to protect her. We talk about the awfulness of the whole situation, the way her lips trembled when she looked at that family portrait. 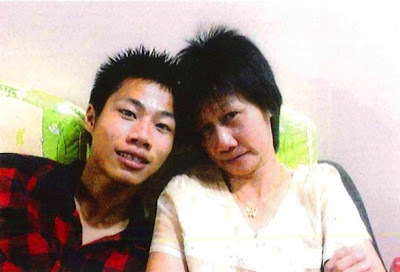 Vui Kong writes movingly about his mother in his clemency petition. She’s one of the reasons he cites for his decision to deliver those drugs. He says he wanted to help pay her medical bills. It’s easy to dismiss his assertion as a desperate attempt at justifying his actions. But then you meet her. You see what her illness has done. And you see flashes of the person that used to be, before life destroyed her spirit. And you understand how an illiterate 18-year-old kid could have gone down that path. He was young and he was foolish. But he thought he was doing his best. For his mum. The Online Citizen and the Singapore Anti-Death Penalty Campaign are organising a gathering in support of Yong Vui Kong this Sunday. We’re planning to go and hope to see you there too. If you think the boy deserves a second chance, please sign the online petition here.